Kevin McCarthy, president of Arizona Tax Research Association, or ATRA, said the private hospitals came to his group almost a year ago to express serious concerns about Proposition 480, a measure to build a leaner county hospital and upgrade the health system for the poor. He was hoping for money from them for an opposition campaign, but it hasn’t materialized. The Maricopa County Hospital District, which does business as Maricopa Integrated Health System, is asking for voter approval to for the massive loan to upgrade a network of neighborhood clinics and the mental health system, and tear down and rebuild a smaller version of the aging Maricopa County Medical Center. The financing would also go towards improving the trauma center and burn center. 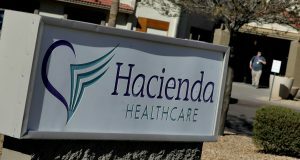 Executives with the Banner Health, Dignity Health Arizona, Scottsdale Lincoln Network, and Abrazo, which make up 80 percent of the hospital market in Maricopa County, also met with the Arizona Republic editorial board in August amd questioned the financing. The executives said the current market can absorb the capacity so there is no need for taxpayers to finance a new hospital to replace the old one. They also said a new hospital isn’t needed because most patients are now treated outside of hospitals except for the sickest of them. Representatives from all four hospitals were asked repeatedly to comment on this story but refused. Steve Purves, CEO of MIHS, said executives with the private hospitals have also expressed their concerns about the financing to him, but he doesn’t think any of the boards of those hospitals have voted to take an official stance on the issue. “We have discussed all of those issues and more,” Purves said. The money for a No campaign led by ATRA is only trickling in. McCarthy said ATRA has pledged $25,000 and NAIOP, a group representing commercial real estate interests, has given $10,000. Tim Lawless, NAIOP president, said NAIOP would be in favor of the ballot measure if it were scaled back to include upgrades only to the hospital’s trauma unit, the burn unit and the mental-health system, but the proposed debt service is too great and too many services are already covered by the private sector. “Our opposition was predicated on other organizations coming forward and contributing money to the opposition campaign,” Lawless said. He said he is confident other groups are going to give to the opposition, but the Yes on 480 campaign has raised nearly $1 million, mostly from the construction industry, doctors and nurses who work at the hospital and a fundraising foundation for the county health system. “We know we’re going to be dramatically outspent,” McCarthy said. The Arizona Chamber of Commerce and Industry and Mesa Chamber of Commerce have also decided to stay on the sidelines. The boards of both chambers voted to take no position, the spokesman of the respective chambers said. Those votes came after a full-court press by political consultant Chuck Coughlin, whose firm is running the pro campaign. He sent letters to the board members of both chambers to let them know it “behooves” them to stay out of it and let voters decide. Coughlin suggested the Arizona Chamber of Commerce could have an image problem if it voted against the measure because the hospitals on the board have 80 percent of the market compared to MIHS, which has five percent, most of which is underinsured or uninsured. “If the chamber weighs in, it could be perceived as being anti-competitive, standing with the large, wealthy providers against the smaller vendors in the marketplace,” Coughlin wrote.